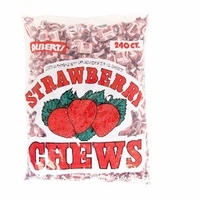 Great tasting strawberry chews by Alberts Candy Company. Each bite size chew is just bursting with a sweet strawberry flavor. These are the perfect size treat for parade candy, putting in party favor bags, pinata's or just to eat.